A false-color mosaic of the Coma cluster reveals thousands of new faint objects (green), many of which belong to the cluster. The mosaic combines visible-light data from the Sloan Digital Sky Survey (color coded blue) with long- and short-wavelength infrared views (red and green, respectively) from NASA's Spitzer Space Telescope. 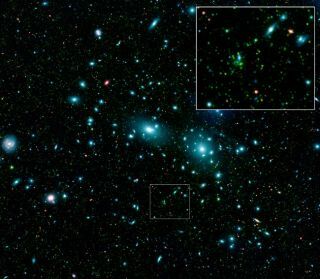 More than athousand previously unknown dwarf galaxies have been detected in the Comacluster of galaxies 320 million light-years away by NASA's Spitzer SpaceTelescope. Though tinycompared to bigger galaxies, dwarfgalaxies play a crucial role in cosmic evolution. Astronomers think theywere the first galaxies to form, providing the building blocks for largergalaxies. They?re also the most numerous type of galaxies around: Computersimulations, in fact, suggest that giant clusters of galaxies should containmore dwarf galaxies than astronomers have observed. To find thethousands of ?missing? galaxies, astronomers at NASA?s Goddard Space FlightCenter in Greenbelt, Maryland, stitched together 288 individual exposures fromthe SpitzerSpace Telescope. Each exposure lasted 70 to 90 seconds, forming a largemosaic covering 1.3 square degrees of sky when combined with the image data fromthe Sloan Digital Sky Survey. Though a small chunk of the sky, the team foundalmost 30,000 new objects in a relatively short period of time. To theteam?s surprise, many of the new objects turned out to be Coma galaxies, notgalaxies beyond the cluster. Leigh Jenkins, a GSFC astronomer, estimates thatabout 1,200 of the faint objects are dwarf galaxies?many more than have beenpreviously identified. "Wehave suddenly been able to detect thousands of faint galaxies that weren't seenbefore," Jenkins said. Her team's study of the Coma cluster is detailed ina recent issue of the Astrophysical Journal. How canastronomers see such faint galaxies? The universe emits a wealth of visiblelight, which allows us to se stars with an unaided eye. But most of the lightfrom space is invisible to humans?which is why telescopes like Spitzer that can?see? infrared light help astronomers make new discoveries in well-studiedparts of the cosmos. The teammay have found thousands of new objects, but additional Coma dwarf galaxiesmight be lurking in the Spitzer telescope data, the team said. By usingtelescopes that can see even ?deeper? into the cosmos, the astronomers are currentlytrying to find out how many of the faintest objects belong to the Coma cluster.